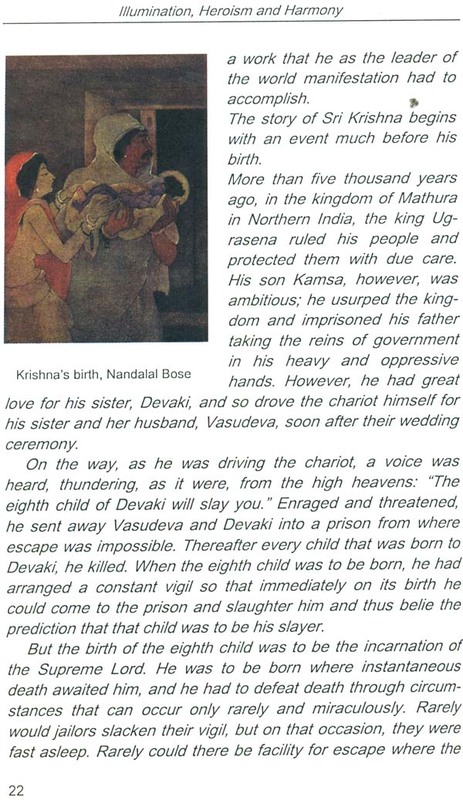 Sri Krishna’s exile to Brindavan is a landmark in the history Indian religion, considering that the episodes Cr’ connected with that exile have given birth to the practice and yoga of divine love which takes us to the depths and intimacies of human emotions turned to the Divine and the Divine response that uplifts various layers of human consciousness, even the vital and sensuous to their divine counterparts. Sri Krishna’s sweetness and the alluring charm of His flute surpass even the oceans of Ananda and capture the human soul into the most intimate secrecy of the human relationship with the Divine. The Rasa Lila of Sri Krishna with the Gopis and the love of Sri Krishna with Radha and of Radha with Sri Krishna have become for all spiritual seekers a symbol of the Divine Harmony that can be established on the earth as also of the creative power of Divine Love. 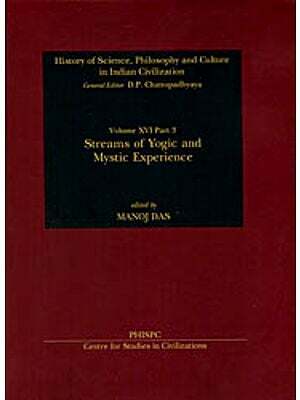 This book is an anthology of episodes taken from various literary works that depict the episodes connected with Sri Krishna’s exile to Brindavan as also of some of the significant poems, comments and essays that aim at clarifying and illumining the secrets of Sri Krishna as an Avatara and the impact that Sri Krishna has made on the human hearts that have turned to the intimacies of Divine Love. 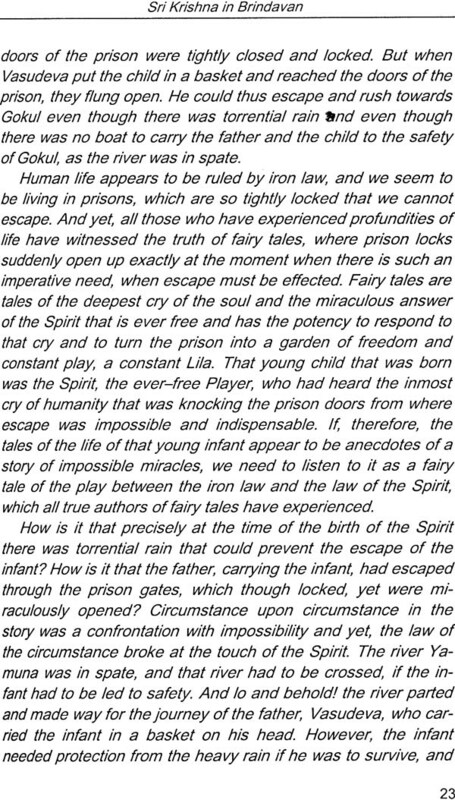 A-few extracts from Sri Chaitanya and Sri Ramakrishna, as also from Sri Aurobindo and The Mother’s “Radha’s Prayer” indicate the living testimony of the reality of Sri Krishna and the work that He continues to do for the evolution of consciousness on the earth. 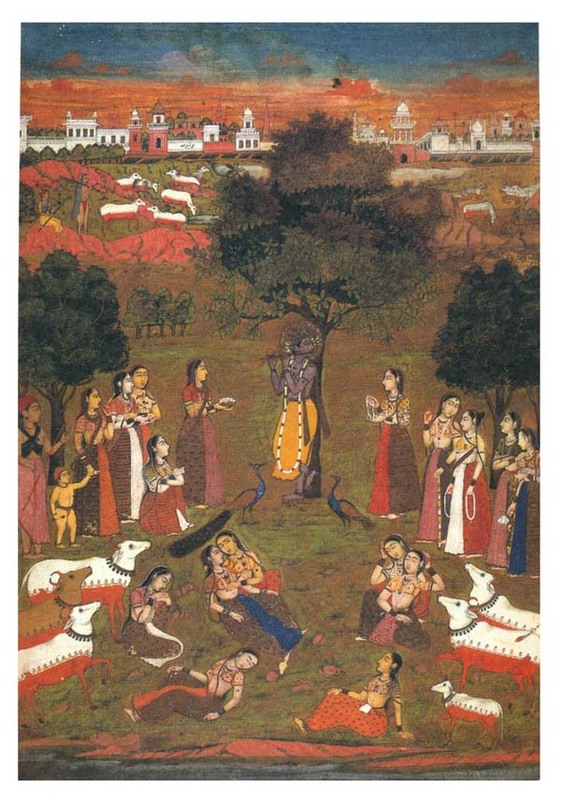 The aim of this anthology is to introduce to the reader some significant passages and poems that will provide illuminating impressions of some of the relevant original works, and it is hoped that the reader will feel invited to turn to the original works in an ever continuing pilgrimage to the sanctuary of Sri Krishna. Secondly, it is rightly contended that the proper inspiration to turn to value-orientation is provided by biographies, autobiographical accounts, personal anecdotes, epistles, short poems, stories of humour, stories of human interest, brief passages filled with pregnant meanings, reflective short essays written in well-chiselled language, plays, powerful accounts of historical events statements of personal experiences of values in actual situations of life and similar other statements of scientific philosophical artistic and literary expression. Thirdly we may take into account the contemporary fact that the entire world is moving rapidly towards the synthesis of the East and the West and in that context it seems obvious that our teaching-learning material should foster the gradual familiarisation of students with global themes of universal significance as also those that underline the importance of diversity in unity. This implies that the material should bring the students nearer to their cultural heritage but also to the highest that is available in the cultural experiences of the world at large. Fourthly an attempt should be made to select from Indian and world history such examples that could illustrate the theme of the upward progress of humankind. The selected research material could be multi-sided, and it should be presented in such a way that teachers can make use of it in the manner and in the context that they need in specific situations that might obtain or that can be created in respect of the students. The research teams at the Sri Aurobindo International Institute of Educational Research (SAIIER) have attempted the creation of the relevant teaching-learning material, and they have decided to present the same in the form of monographs. It may be useful to explore the meanings of these terms — illumination, heroism and harmony — since the aim of these monographs is to provide material for a study of what is sought to be conveyed through these three terms. We offer here exploratory statements in regard to these three terms. 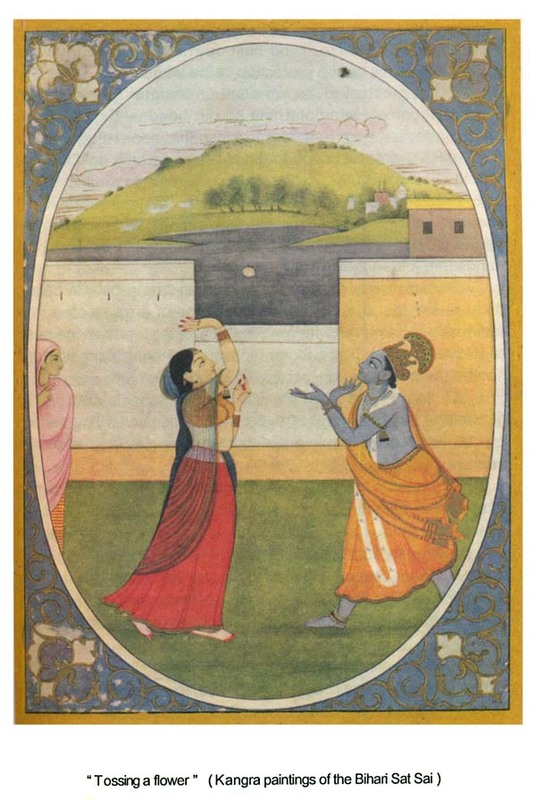 The principal theme of this monograph is centred on harmony; it presents the story of Sri Krishna and his manifestation in Brindavan as the sweetness and nectar of Divine Love that mysteriously binds the individual soul with the Supreme and with all the other souls and manifestations of the Supreme in the world. In the depth of the human soul there breathes the Reality to whom it is offered irresistibly and unreservedly. 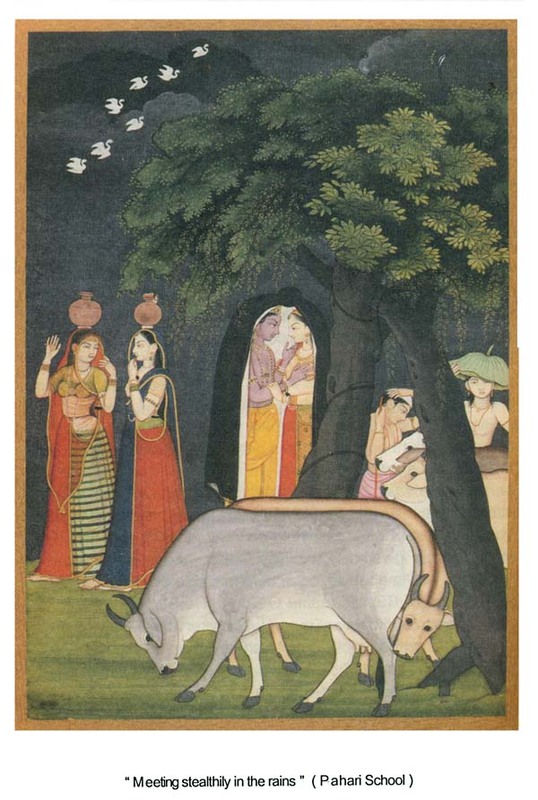 The story of the Gopis is the story of human souls when they happen to discover in their midst, their Lord, without whom there is no breath of life. The relationship between the Gopis and Sri Krishna is the relationship of total harmony of which all the conceptions of harmony that we find in ordinary human life even when they are exalted to their maximum expression are only faint imitations. Humanity needs today peace and understanding, but in the ultimate analysis it is only the love of the soul for the Supreme that can sustain the required peace and understanding. The acme of this love of the human soul for the Divine is illustrated in the symbolic dance of Sri Krishna with the Gopis, the Rasalila, symbol of the symphony and festivity of total harmony. There are four very great events in history, the siege of Troy, the life and crucifixion of Christ, the exile of Krishna in Brindavan and the colloquy with Arjuna on the field of Kurukshetra. 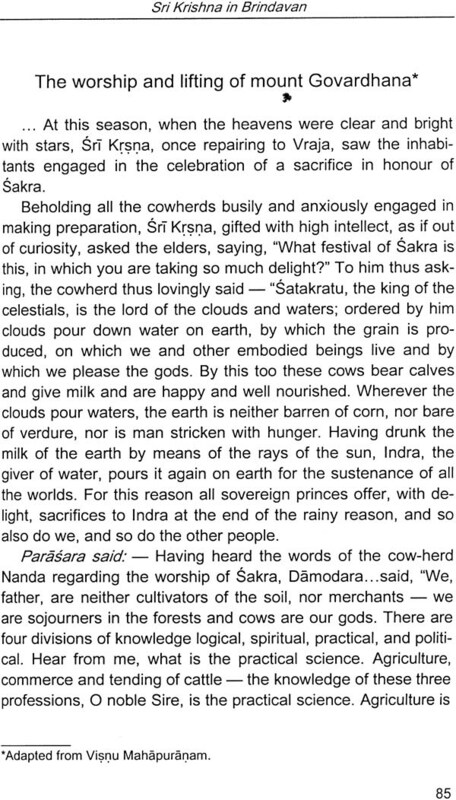 The siege to Troy created Hallas, the exile in Brindavan created devotional religion, (for before there was only meditation Europe, the colloquy at Kurukshetra will yet liberate humanity. Yet it is said that none of these four events ever happened. Sri Krishna’s life, as it is narrated in the Puranas and in several other writings, reads like a legend or even like a myth. It is sometimes argued that Sri Krishna and his life have only a symbolical value. It has also been doubted whether Sri Krishna ever lived in any historical or prehistorical time. 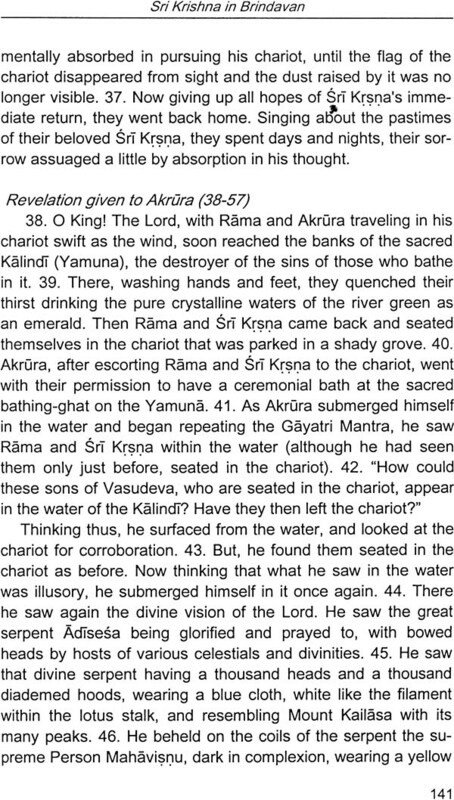 Even the Mahabharata is viewed sometimes as fiction that could have been based on some historical facts. The great episode, which has been depicted in the Gita has come to be viewed by some interpreters as a parable or as an allegory of an inner battle of good and evil that constantly takes place within the human personality. Despite all this, Sri Krishna has been experienced by a large number of mystics, saints, sages, poets and thousands of men and women as the incarnation of the Supreme Lord, and there are numerous accounts of these experiences the authenticity of which has been upheld by fresh experiences of leading mystics and yogins who belong to different ages in our history, and even in our own times. In any case Sri Krishna is a living reality for teeming millions in India and elsewhere, and it is that reality which is read by devotees in the accounts of Sri Krishna given in the Mahabharata and in the Puranas and in various other accounts. Like millions in India, we simply love Sri Krishna, and we do not enter into debate about the object of our love. The stories that we have read and the stories that we have collected in this book give us celestial delight and inspire us to do all we can to arrive at that experience which many mystics have had. Who would not love to see the smiling face of Sri Krishna? Who would not love to hear the call of Sri Krishna and to listen to his flute? Who would not like to be uplifted by that splendid vision of the universe that Yashoda saw in the mouth of that mischievous boy who is known as Sri Krishna? Who would not like to have that Time-Vision in which Arjuna saw Sri Krishna as the Supreme Lord in action in the battlefield of Kurukshetra? Like millions in India, we would like to be flooded by the oceanic wave of love that drowns us in the depths of the sweetness of Sri Krishna. 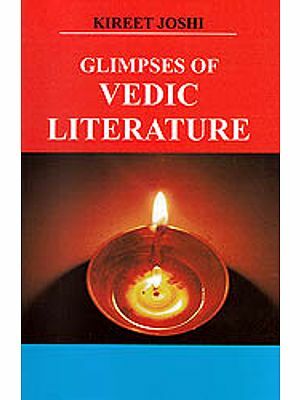 This book is a short anthology meant for readers who would like to have a glimpse of Sri Krishna and to learn of some of the accounts of Sri Krishna that are found in the Srimad Bhagavata Purana, Harivamsa Purana and Vishnu Mahapurana. At the same time, we feel that these accounts would be better understood if we presented a few extracts from the writings of Sri Aurobindo, the Supreme Master of Yoga of our times, who had had himself genuine experiences of Sri Krishna, and who has explained the profundities of the Gita in his famous ‘Essays on the Gita”, and who has expounded the value of Puranic literature in his famous work, “The Foundations of Indian Culture”. He has also explained in his writings the depth of that religion which has arisen in India from the episodes connected with Sri Krishna’s exile in Brindavan. We have, therefore, thought it appropriate to present a few relevant extracts from Sri Aurobindo’s “The Synthesis of Yoga” and “The Foundations of Indian Culture”. We have also felt it useful to bring together a few poems, which have been written on Sri Krishna by some of the famous saints and poets of India. The sweetness and intensity that these poems convey to us are indescribable, and we would like the readers to plunge into this sweetness and intensity by reading these poems. 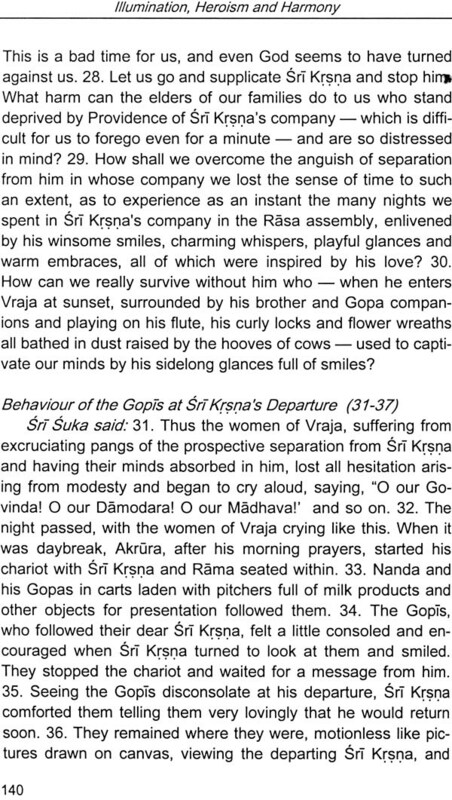 We have included here some extracts, which describe some of Sri Ghaitanya’s and Sri Ramakrishna’s experiences of Sri Krishna and Radha, which bring to us the living and continuing reality of Sri Krishna’s consciousness. 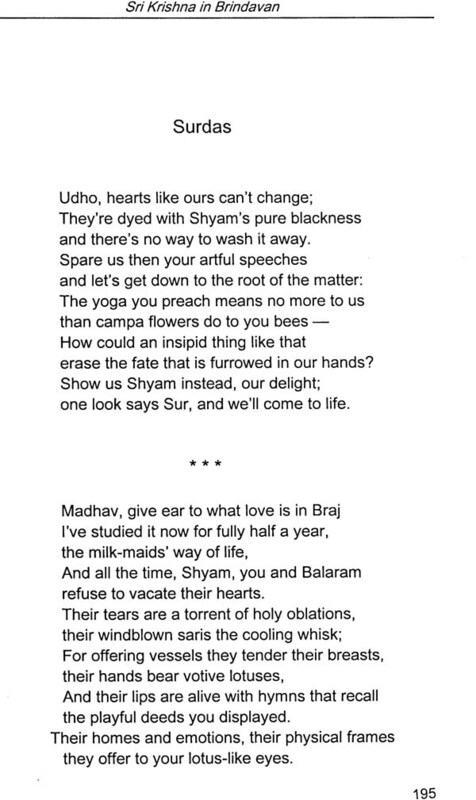 The poems of Surdas have been taken from J.S. Hawley’s translations, of Nandadas from (ho translations by R.S. McGregor, and Mirabai’s songs from A .J. Alston. The rest of the poems are translations by Sri Aurobindo, the magic of which will undoubtedly be felt by the hearts and souls of sensitive readers. The texts concerning Sri Krishna in Brindavan have been adapted from Srimad Bhagavata translated by Swami Tapasyananda and Srimad Bhagavat Mahapurana translated by CL. 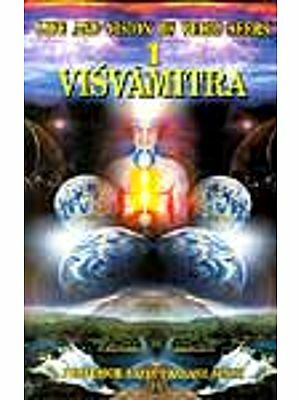 Goswami The texts adapted from Harivamsa Purana are from the translation by Bhumipati Dasa, A short text adapted from Vishnu Mahapuranam is from the translation by MN. Dutt.